good way to wash toilet. just close lid, sit and flush a few times..
Hey Wiersy old mate...a rotary kitty wash. Don't fergit to close the lid, sit on top, and keep dangly bits from hangin' over the side while the "ride" is in progress. LOL great (dirty and disturbed) minds thinks alike.. I just hope that its a big hole in the bottom of the ride for a big finale . My brother gave me one of these years ago as a birthday present !!! I can’t find him right now but he’s here somewhere. He even came with a death certificate. Cats, like their nemesis, the dog .... do get dirty and have a variety of odors... from smelling like the outhouse where you camped last year to the same odor as your dog's breath. (Remember... your dog will try to eat anything.) 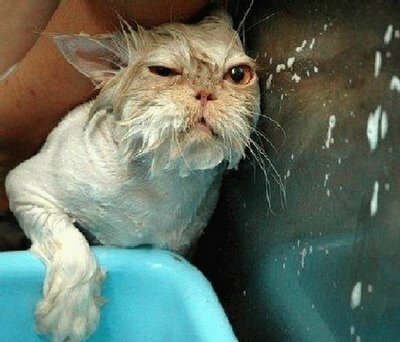 Now we all know that cats HATE water. 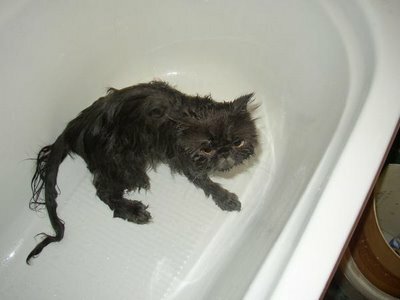 And we know that giving the cat a sedative to ease this process of a bath is out of the question. Although your cat has the advantage of smarts, quickness and total lack of concern for you .... you have the advantage of size, strength, and the ability to wear protective garments. 1. First .... dress for the occasion. A 4-ply rubber wet suit is suggested, along with a helmet, face mask and welders gloves. 3. Have the Kitty Bubbles and towel in the enclosed bathtub area before hand. 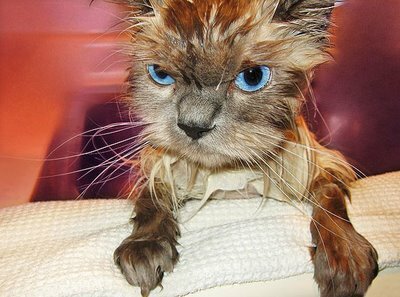 No ... blow drying the cat after the bath is not suggested. 5. Find your cat. Use the element of surprise. Pick the cat up, nonchalantly as if you were simply carrying him/her to the supper dish. No need to worry about the cat noticing your strange attire... the cat barely notices you anyway. 6. Once you and the cat are inside the bathroom .... speed is essential. In one single liquid motion .shut the door to the bathroom, step into the shower, close the sliding doors, and drop the cat into the water. 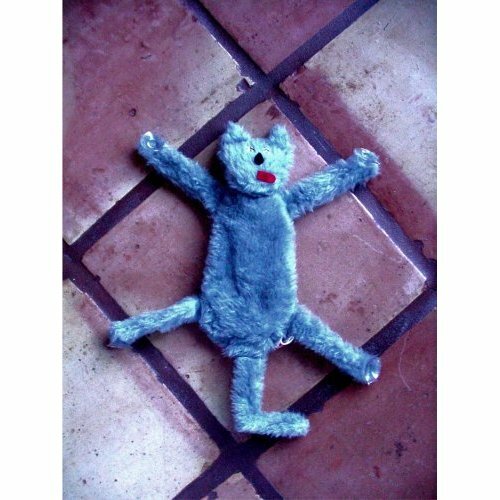 While the cat is still in a state of shock, locate the Kitty Bubbles and squirt whatever part of him is above the water line. You have just begun the wildest 45 seconds of your life. Remember that cats have no handles and add the fact that he now has soapy fur. His state of shock has worn off and he's madder than a wet hornet. 10. Next, the cat must be dried. No...this is NOT the easiest part. By this stage, you are worn out and the cat has just become semi-permanently affixed to your right leg. We suggest here that you drain the tub and in full view of your cat . reach for the bottle of Kitty Bubbles. 12. Be sure cat is firmly wrapped in towel before opening tub enclosure. Open bathroom door .... put towel wrapped cat on floor and step back quickly. Into tub, if possible, and do not open enclosure until all you can see is the shredded towel. 13. In about 2 hours .... it will be safe to exit the bathroom. Your cat will be sitting out there somewhere looking like a small hedgehog while plotting revenge. 5. Flush the toilet three or four times. This provides a "power-wash and rinse". WOW that is hilarious!!!!!!! Almost makes me wish I had a cat. We have a lake about 1/4 mile down the road I always thought it was fun taking cats out in the boat and ejecting them in the middle. Surprising what good swimmers they are. Now I'll have to see if I can get my son to try Vince's methods!!! !